Are you worried about keeping your baby warm and healthy this winter? It’s common for parents to worry when the colder weather starts to set in; especially in areas where snow is a common occurrence during the winter months. However, the good news is it’s really not as difficult as you might think to ensure your little one is warm, snug and healthy. You don’t have to stay stuck indoors either. In fact, a little winter air is great for both you and baby. So, rather than hibernating for a few months (however tempting that may be! ), check out the tips below on how to keep baby warm and healthy this winter. Venturing Outdoors? Don’t Forget The Layers! As well as being unhealthy, staying indoors for the entire winter sadly isn’t realistic. There’s going to be times you need to venture out into the cold with your little one. However, provided you dress baby correctly, it really shouldn’t be an issue. The key is to dress your baby in layers. That way, if they become too hot or cold, you can simply take off, or put on, another layer. As a general rule of thumb, babies need one extra layer than adults do during the colder weather. A lot of parents use this for guidance, creating a “plus one” mindset. Basically, with the plus one method, you look at how many layers you’re wearing to feel comfortably warm, then give baby an extra layer than what you’re wearing. You’ll also want to ensure baby has gloves, a hat and socks. All of the layers work to trap the warmth close to your little one’s body. It isn’t just the cold weather outside you need to think about. The house typically tends to get a lot colder in winter too; especially during the night. So, you’re going to need to winter-proof baby’s crib, too. While it may seem like a good idea, using an electronic based comforter in the crib can be problematic. It may sound cozy, but a heated comforter could easily cause baby to become too hot during the night. Now, some advice you’ll find online, is to use the same kind of layering system as you would with clothing. That means, adding layers of blankets to the bed. However, this can actually be a lot more dangerous than adding an electric comforter. Some experts warn that layers in the crib could lead to suffocation. It’s also been linked to cases of SIDS (Sudden Infant Death Syndrome). So, it’s definitely recommended you don’t try using layers. So, if you can’t use extra blankets, what can you use to keep baby warm? Well, a winter style bodysuit could be a great option. Or, you could try the swaddle blankets too. These are actually great for encouraging baby to sleep too so you may want to consider using them purely for that purpose! If you are concerned, it’s worth chatting to your pediatrician or doctor to see what they recommend. Dry and itchy skin is a common issue for adults during winter, but it’s also a potential problem for baby too. You’ll notice it starts to get a lot drier in the house, especially if you have the heating on a lot. A good solution is to invest in a dehumidifier for baby’s room. This will add moisture to the air, preventing the skin from drying out. The only thing to be aware of here, is that the humidifier should be a cool mist variety. This is largely because if it’s a warm mist variety, it’s going to be quite hot to touch. While your baby isn’t likely to get out of their crib, walk across the room and touch it, it will still blow out warm air and potentially cause baby to overheat. So, stick to a cool mist dehumidifier to be safe. Another tip is to keep baths at a lukewarm temperature and limit bath time to around just 10 minutes. Avoid using soap during winter too. Instead, try to use a hypoallergenic cleanser. Pat baby dry, then apply a hypoallergenic moisturizer. Finally, it’s also a good idea to apply an emollient before you and your little one head out. The harsh winds can really irritate baby’s skin, so applying emollient onto the lips and the face can help to prevent baby’s skin from drying out. Even if you haven’t started weaning your baby yet, you’ll still want to pay attention to their diet. If you’re breastfeeding, what you eat will be passed onto your little one. So, to decrease their chances of getting sick, it’s a good idea to eat a healthy, balanced diet. Focus on fruits and vegetables which are high in vitamins and minerals. This will help baby’s immune system, as well as yours, lowering the risk of illness. As baby’s immune system isn’t fully developed, you’ll want to make sure you’re taking extra hygienic precautions. This means, washing your hands for longer than usual, and keeping baby home more during the winter. Of course, as mentioned earlier, you don’t have to stay indoors the entire time. However, it’s especially important to keep baby home during the first six months after birth. This is when they are at their most vulnerable and could easily pick up a virus. When you’re looking for tips to keep baby healthy this winter, you probably didn’t expect to see a stress reduction tip! However, it’s actually been shown that infants living in a happy, healthy environment, are a lot more resistant to colds and viruses. It makes sense when you think about it. Although an emotional response, stress can have a negative impact on your physical health. If baby is stressed out and unhappy a lot, it’s therefore going to weaken their immune system further. So, focus on creating a happy, fun environment for your little one. This can have a surprisingly positive effect on their overall health. It may be pretty cold for you, but your baby may be warmer than you might think. Their temperature can also change pretty rapidly. Therefore, it’s a good idea to continuously check baby’s temperature throughout the day. If you’ve wrapped your baby up in layers to head out of the house, remember to check their temperature several times while you’re out. If their lips, hands and feet start to turn blue, it’s a big indication that they’re too cold. If on the other hand, they’re sweating and feel hot to the touch, you’ll want to take a layer of clothing off. Always check the temperature frequently throughout the winter days. These are just some of the top tips guaranteed to help you keep baby warm and healthy this winter. However, don’t hesitate to reach out to your doctor or pediatrician and ask for their advice. 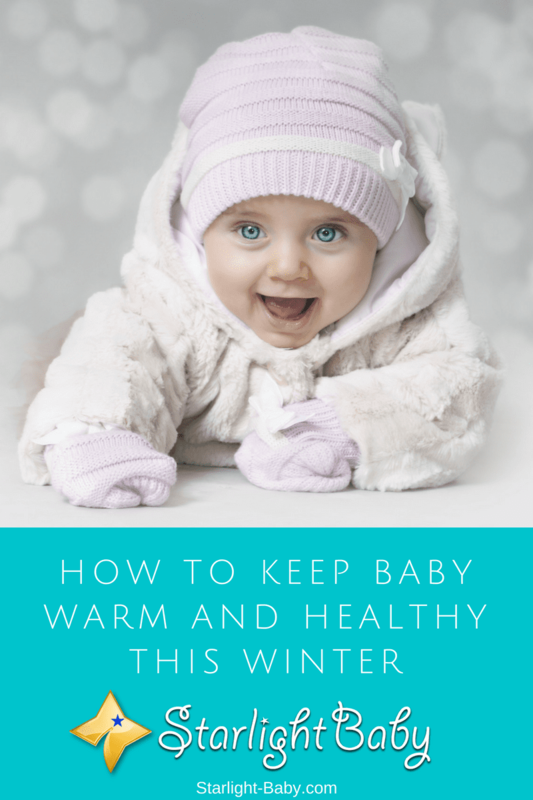 While there are things you can do to keep baby warm and healthy this winter, it’s actually not as difficult as you might think. Keeping the baby warm during winter is very important. These are reliable information that helps us to make the baby comfortable and enjoy this season. Even for adults, our skin become more dry so it’s important to apply moisturizer and drink more liquid to keep us moist. Prevention of having dry skin is easy but needs more effort specially to the young ones. Once they feel itchy, they are irritable which makes them cry or not comfortable. Dry skin is commonly experience during winter so we need to spend more time applying moisturizer thats recommended by our pediatrician to keep the baby’s skin moist. I totally agree that parents should only use moisturizers on the baby that are doctor-prescribed. Some moisturizers have ingredients that could harm the baby’s skin so the best person to recommend what should be used is the pediatrician. If babies have dry, itchy skin, they will surely become irritable and both parents and baby will have sleepless nights. Parents should always ensure the baby is comfortable all through the winter season. I agree that we should check baby’s temperature. We always place the back of our hands on baby’s forehead or chest and feel if they have a fever or if they are cold. Babies tend to get sick faster in winter and I agree that we should make the environment at home to be stress free and as a mother, we should take a balanced diet. You are very much welcome, jessym. We are glad to be of help. Reading blog articles like this would really help inform a lot of parents, especially first-time parents, about how to take care of babies. We cannot rely on trial and error all the time. There would be instances when we have to be certain about what we need to do because it’s crucial for baby’s safety. Preparing a baby for winter is definitely one of those instances. I may be an adult, but I know how cold and dry the winter makes me, which indicates that it’s especially important to ensure our children are well looked after during this season. Enforcing the plus one rule and investing in a dehumidifier while also taking special care to pay attention to the baby’s diet are good tips. It’s difficult to know how another person is feeling in different kinds of weather, and this is multiplied by the fact that our babies may not be able to properly let us know. Let’s keep our babies warm this winter! Yes, hanseung, we need to pay special attention to the baby’s needs because you are so right when you said they’re still not able to properly let us know what they’re feeling. We could only guess what they’re going through and try to assess their situation so we can deal with it the best way possible. Babies are human beings too, so like adults, they would also feel the biting cold. It is truly important that we make them comfortable during winter. In Nigeria, seasons like the winter period is when we always see high cases of mortality deaths which is as a result of cold and catarrh affecting the baby. Honestly, I’ve learnt so much from this article on how we can enjoy our days during these cold periods and one thing is that the baby will feel comfortable as well. Since I joined this blog, I’ve enjoyed everything bit of information that I’ve read in this space for they’ve really been helpful in shaping my ideas about nursing mothers, babies and the kids in general. Thank you so much for giving us the platform to learn about baby’s health. You’re very much welcome, Henrywrites. We’re so glad that we are able to help parents with our blog articles. So sad to hear about the high baby mortality rate in your country during the cold months. We do hope you could share the info you’ve learned here with other parents so they can protect their babies during the cold months. Thank you for wishing the babies and moms here long life. One thing I’ve done since I joined the blog is sharing the amazing tips I learn from here with my mom, some neighbours around on how to manage the pregnancy, baby and toddler period in their family. I’m optimistic that it will yield results in no distance time. When it comes to parenting, me and my wife are a first timer. So we are clueless to everything that is happening to our baby. Specially when it comes to her health, we have a lot to learn. when “ber” (September, October, November, December) months kicked in, our baby started to catch colds frequently. More or less, she’s having colds and stuffy nose for as frequent as every 2 weeks. So we visited her doctor for check ups frequently and she told us that aside from her immune system just developing, this is also the season where a lot of babies do get colds and stuffy nose because of the cold weather. So she told us just to keep her warm and comfy specially during the night to help ease the effects of her colds and stuffy nose and gave us some saline drops for her nose. My wife suggested to me that we should lessen the time our baby is outside to lessen her chances of catching colds. But i told her that it’s a good idea but it’s better to strengthen her immune system by feeding her appropriate foods and maybe giving her vitamin c during the cold months since she is already 9 months old and can already eat fruits. Yes, I would say this is the time of the year when babies tend to catch colds more frequently. You should do your best to keep your baby warm during this season. Saline drops are truly helpful in relieving stuffed noses and sore throats. As for Vitamin C, it is always best to ask her pediatrician about recommended Vit. C supplements. Personally, I would say that avoiding exposure of the baby to cold and ensuring that they are well covered should be the starting basis of keeping the baby warm during winter. Babies are known to have a very delicate skin and aren’t well built up to endure cold weather. Their body system are too weak to regulate temperature on its own without external influence of the parent or guardian. So therefore, it’s the duty of the parents or a nursing mother to always check the baby’s body temperature during winter periods in order to determine whether to increase in adding more warmth to the baby or not. Yes, keeping the baby warm inside the house is important. Parents should not take a baby out if it’s not an important trip. As you said, they do have delicate skin which could become sensitive to the biting cold outside. As always, parents should be conscious of their child’s well-being. A close monitoring of the baby’s health is necessary. The information on winter-proofing the baby’s crib really helps. Like I’ve said in other comments, we just moved from South Florida and are all still kind of getting used to no longer living in a tropical climate and being somewhere with actual seasons. This is something I wouldn’t have given much though to until now. Thank you! I am reading this article at the right time. My baby is just six months and winter is already here. The winter temperature is not too cold here, the lowest recorded temperature was 3-degree Celsius, however, the baby will feel cold at any temperature. I am learning how to keep my baby warm. Your tips are certainly useful. I really love babies! At six months, they’re just the cutest thing. This is such a great advise, babies are really close to cough and colds when the winter comes. Here is just a friendly advise from me, Do not shower your baby with a cold water it should be warm. Do not let your baby drink a cold water. But still the best way to keep a baby warm and healthy is a hug from their parent. That is true – babies are more prone to a cough and colds during winter so we must be extra careful with them. Thank you for sharing your helpful tip on bath time. And yes, parents should not give cold water to babies, I would say it’s a no-no. Indeed, nothing beats warm hugs!